You spend a lot of money on Google AdWords. But is it really working for you? Google sprays you with a firehose of raw data about the performance of your AdWords advertisements. They tell you exactly what happened with your ads. 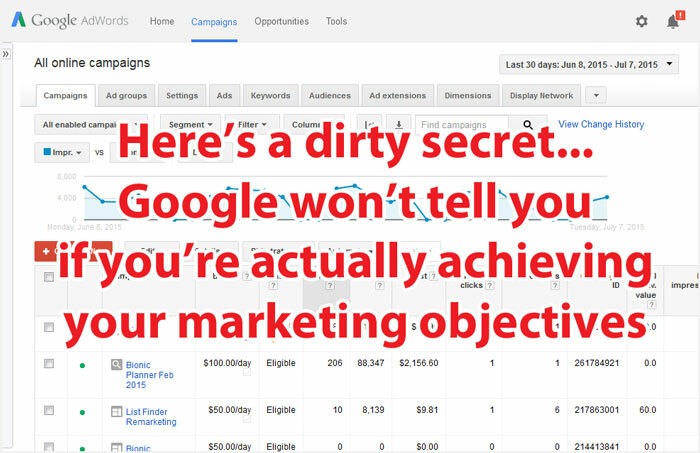 However, Google won’t tell you if you’re actually achieving your marketing objectives. That’s because Google isn’t accountable to your marketing objectives. But, of course, you’re personally responsible for Google AdWords just like you are with all your other marketing investments. The problem is it’s virtually impossible to monitor your Google AdWords performance for all your campaigns for all your clients without an automated monitoring system in place. Excel spreadsheets are completely impractical: you can’t afford to spend half your day exporting data from AdWords and crunching numbers in Excel without neglecting your other responsibilities and driving yourself crazy. If you want an easy and effective way to add accountability to your Google AdWords advertising, you should consider the Bionic marketing performance management tool for AdWords. Bionic will help you to monitor your progress against your goals and to optimize your AdWords investments. With Bionic, you get a low-cost, hassle-free system that automatically monitors your Google AdWords advertising performance against all your marketing objectives. 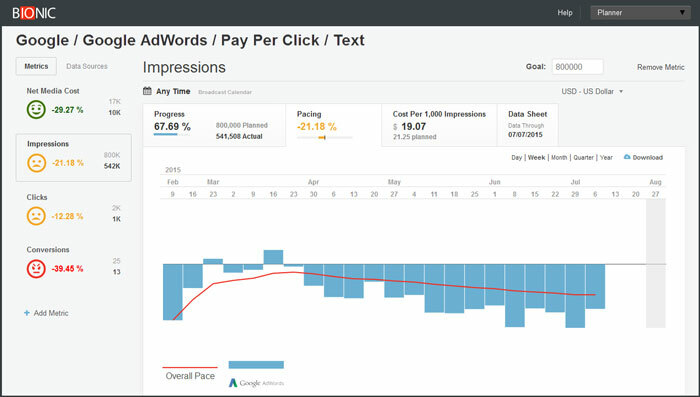 It automatically pulls the raw performance data from AdWords, runs all the progress and pacing calculations, and serves up the results in an elegant dashboard – so you’re confident you’re right on track, every day. Google practically invented search engine marketing with its AdWords advertising service. Millions of advertisers use AdWords to make sure their products and services are on top of mind when using Google to search for information. In 2014 alone, advertisers spent more than $45 billion on Google AdWords. One of the great things about AdWords is the instant feedback you get on the ads you run. Google will tell you exactly what happened with your advertisements: how many impressions, clicks, conversions, sales, etc. Are we on track to hit our impressions goal? How does our actual CPM compare to our planned CPM? Are we on track to hit our clicks goal? How does our actual cost per click compare to our planned cost per click? Are we on track to hit our downloads goal? How does our actual cost per download compare to our planned cost per download? Are we on track to hit our sales goal? How does our actual cost per sale compare to our planned cost per sale? … and dozens of other basic marketing questions like this. Bottom line: Google is not accountable to your marketing objectives. However, you’re accountable for your Google AdWords advertising just like every other advertising investment. So, you need to a good way to monitor its performance against your marketing objectives. After gathering the data, compare it against the daily plan for each of your marketing objectives. Although straightforward, it would take hours every day to execute this process even for a small number of AdWords campaigns. It would be virtually impossible because you have more clients and more campaigns than hours in a day. Because of the high degree of effort, you can’t afford to do this precise tracking without neglecting your other responsibilities. But, you can’t effectively do strategy and optimization without this precise tracking. Fortunately, there’s a better way to add accountability to AdWords that will solve this dilemma for you. Imagine waking up every morning and all the work of gathering, measuring, calculating, and auditing your Google AdWords performance has already been done for you. You simply open up a dashboard to ensure your AdWords campaigns are on track and to identify any discrepancies from your plan. Although Bionic’s productivity benefit is the easiest to quantify, it’s not the biggest benefit. The real benefit of automating your performance monitoring is gaining better insights that can be used to optimize your AdWords investments. It spotlights which tactics are not working so you can turn them off. It spotlights which tactics are working great so you can dial up the investments. It’s hard to quantify the impact of smarter investment, but it’s clearly much, much bigger than productivity savings. The Bionic marketing performance management tool isn’t limited to just Google AdWords. You can also use Bionic to precisely track your marketing performance against all your marketing objectives across all your marketing platforms including Google, Facebook, Twitter, LinkedIn, and others. Finally, a low-cost, hassle-free way to precisely track your Google AdWords advertising performance against all your marketing objectives in one clean, honest monitoring tool.